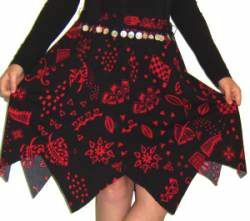 This pirate skirt is perfect if you're in need of a Halloween costume. It's also suitable for musical productions and if you don't have any attachment to it, you can donate it to the music department for their future productions. 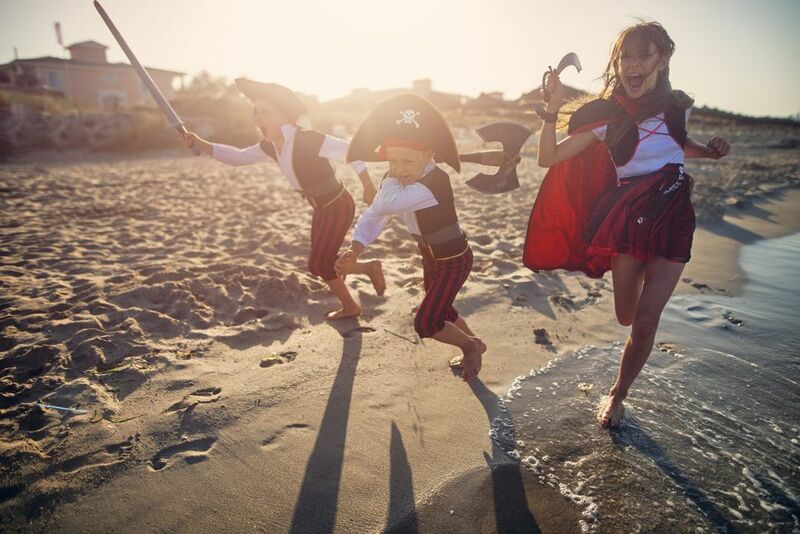 Or you can whip it together if you're attending a pirate themed party any time soon! It's quite easy and simple to make, you just need a few materials. Fabric: Use a medium-weight double knit fabric. The amount of fabric you will need will depend on the size of your pattern piece. Lay yardsticks on the floor, and the pattern piece to determine how much you will need. 1" wide elastic fit to waist plus overlap to secure. Waistband: Cut a 3 1/2" wide strip by the hip measurement plus 1" (seam allowance) long. Cut eight of the pattern piece from your fabric, using the center line as the grain line. Sew the body of the skirt pieces together with wrong sides together using a 1/2" seam allowance, forming a circle. Zig zag or serge the seam allowances. Sew the elastic by overlapping the amount you allowed. Test for waist fit and adjust if necessary. Sew the ends of the waistband wrong sides together, using a1/2" seam allowance. Fold the waistband in half, lengthwise, matching the wrong sides. Mark eight equal sections. These marks will be used to match the waistband to the body of the skirt at the seams. Slip the elastic in the waistband. Baste the edges of the waistband together. Match the eight marks on the waistband to the seams of the skirt. Sew to the skirt, without sewing the elastic, using a 1/2" seam allowance. (If the elastic wants to move into the stitching, take the time to pin the elastic at the waistband to hold it out of the stitching area.) Zigzag or serge the seam allowance. Attach optional trim at waistband if desired. Hand sew thread chains at the waist to hold a scarf or sash. You're all done! Now go give it a spin!